I don’t know if it’s just me, but my viewing schedule of late has left me in something of a despondent mood. From the dystopian world of The Handmaids Tale, to the depressing conclusion of the latest season of Orange is the New Black to the angst-filled The Affair, my favourite shows, while poignant and powerful, don’t exactly leave me with the warm and fuzzies. Sometimes a girl just needs a good laugh especially in this socio-political climate where nuclear war sometimes feels like it’s just one poorly worded tweet away. 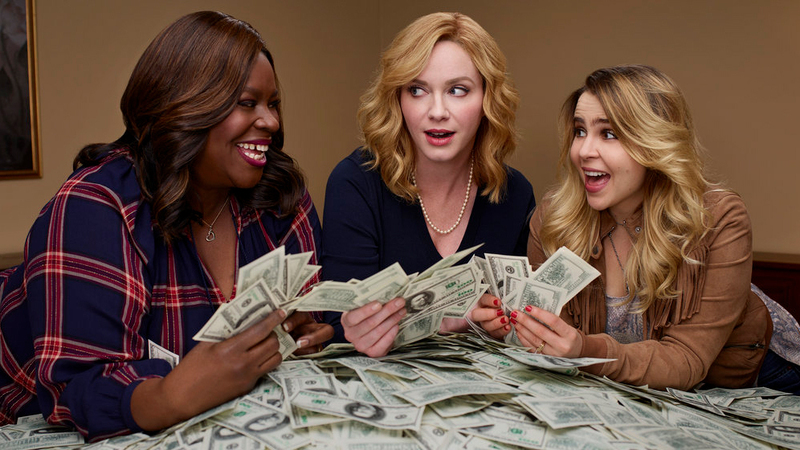 Good Girls is the kind of binge-worthy, chuckle-inducing, suspense-filled show that will keep you up until 3:00 am (it did for me). It follows three regular suburban mums, who after each experiencing some severe financial and personal crises decide that the best and most expedient way to alleviate their woes is by robbing a grocery store. Initially, it seems that their heist has been a great success, but they soon discover the grocery store was a cover operation for a Mexican drug cartel, who they are now consequently indebted to. (Don’t worry, I’m not giving away any spoilers beyond the first episode.) These three upstanding ‘normal’ women therefore begin a side hustle in criminal enterprise. The sheer ludicrously of the plot and the incongruency between the characters themselves and their actions make the show utterly hilarious to watch. The show stars Christina Hendricks of Mad Men, who plays Beth. Watching this poised, pear wearing mother of four delight in money laundering, kidnapping and various dubious criminal activities is truly amusing to watch. Good Girls, while clearly comical in nature, is also a fundamentally poignant reflection of the socio-political culture within the US. Ever since the 2016 presidential election, there has been a renewed focus and vocal frustration over the financial hardship experienced by millions of Americans. The US has an extremely low minimum wage, a fledgeling form of social security and a failing health care system where people routinely die from preventable illnesses for purely financial reasons. Thus, while the show’s plot is funny because of its absurdity, it’s not entirely illogical for reasonable people to be driven to dangerous and criminal acts out of sheer financial desperation. The show also echoes the sentiments of the #MeToo movement in its message of female empowerment. It testifies to the sexual abuse and mistreatment of women in the workplace but does so in a way that doesn’t depict women as hapless victims. Rather, the characters exercise agency and choose to stand up to the men that mistreat them. I thoroughly enjoyed my temporary digress into the world of Good Girls. If you’re looking for a laugh and a show where you can easily let the autoplay roll on take my advice and give this one a go. Have you been down the Good Girls late-night rabbit hole? Let us know in the comments below!